The Choir is everyone who longs and aches to widen their “loving look” at what’s right in front of them. What the Choir is searching for is the authentic. Human beings are settlers, but not in the pioneer sense. It is our human occupational hazard to settle for little. We settle for purity and piety when we are being invited to an exquisite holiness. We settle for the fear-driven when love longs to be our engine. We settle for a puny, vindictive God when we are being nudged always closer to this wildly inclusive, larger-than-any-life God. We allow our sense of God to atrophy. We settle for the illusion of separation when we are endlessly asked to enter into kinship with all. The Choir has settled for little . . . and the “barking,” like a protective sheepdog, wants to guide us back to the expansiveness of God’s own longing. It’s been more than thirty years since I first met Dolores Mission Church as pastor and ultimately came to watch Homeboy Industries, born in that poor, prophetic community in 1988, evolve into the largest gang intervention, rehab, and reentry program on the planet. 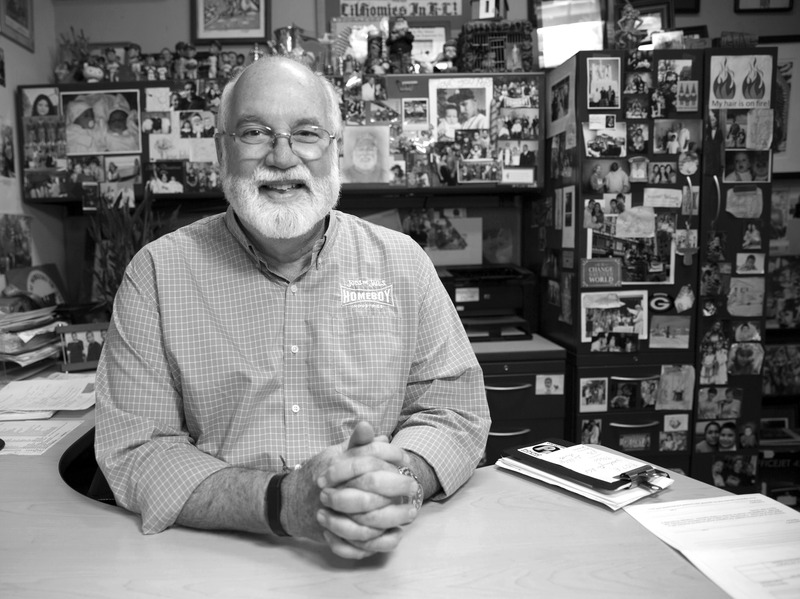 Homeboy has similarly helped 147 programs in the United States and 16 programs outside the country find their beginnings in what we call the Global Homeboy Network. As in my previous book, Tattoos on the Heart: The Power of Boundless Compassion, the essays presented here, again, draw upon three decades of daily interaction with gang members as they jettison their gang past for lives more full in freedom, love, and a bright reimagining of a future for themselves. I get invited to give lots of talks: workshops, keynote addresses, luncheon gigs. YouTube is the bane of my existence. I can go to, say, the University of Findlay in Ohio, or Calvin College in Grand Rapids—two places I’ve never been before—and there will be a handful of folks who’ve “heard that story before.” It happens. I was invited once to give the keynote at an annual gathering of Foster Grandparents in Southern California. I had spoken at the same event the summer before. Virtually the same people, and I’m not sure why they invited me back two summers in a row. After my talk, a grandmother approaches me. I think she liked the talk—there were big tears in her eyes. She grabs both my hands in hers and says, with great emotion, “I heard you last year.” She pauses to compose herself. “It never gets better.” I suppose I’m delusional in thinking she misspoke. I can’t write essays about things that matter to me without filling them with God, Jesus, and the gospel rubbing shoulders with stories, snapshots, parables, and wisdom from “the barrio.” Also, there is here a regular infusion of “Ignatian spirituality”: being a son of Ignatius myself, all the stories of my life get filtered through this Jesuit lens. I only hope the vignettes, koans, and images won’t feel too cobbled, the connections too forced, in the stringing of all this together in my second book. In these elongated homilies, I want to capture the homies’ voices as a window of truth to soften the images of them often portrayed in TV and movies. I should also say that, as in my last book, I don’t mention the name of any gang—they’ve been the cause of too much sadness—and I’ve changed all the names of the homies here. People had previously criticized the absence of a glossary and a reluctance to translate the Spanish. Again, here, I’m hopeful that the context and meaning will all become evident. There will be the occasion when I do translate something. I will, from time to time, step back and explain something. For instance, when gang members say “fool,” they don’t mean anything by it. It roughly means “guy.” “Did you see that fool that walked by?” Once Martin came in excited to tell me that he had just gotten hired at White Memorial Hospital. I’ve learned from giving thousands of talks that you never appeal to the conscience of your audience but, rather, introduce them to their own goodness. I remember, in my earliest days, that I used to be so angry. In talks, in op-ed pieces, in radio interviews, I shook my fist a lot. My speeches would rail against indifference and how the young men and women I buried seemed to matter less in the world than other lives. I eventually learned that shaking one’s fist at something doesn’t change it. Only love gets fists to open. Only love leads to a conjuring of kinship within reach of the actual lives we live. When Karen Toshima, a graphic artist on a date, was caught in gang crossfire in Westwood Village in 1988, police were pulled from other divisions in Los Angeles and pumped into this area adjacent to UCLA. Detectives were reassigned from other homicide investigations and directed to this case. A hefty reward was offered for information that would lead to the arrest and conviction of whoever had done this. I would soon be burying eight kids in a three-week period in those early days. No cops were shuffled around, no detectives were reassigned, and certainly no rewards were offered to anyone for anything . . . leading me to think that one life lost in Westwood was worth more than hundreds in the barrio. I ranted and shook my fist a great deal. As of this writing, I have buried exactly 220 young human beings killed because of gang violence. In those early days, I would shake my fist a lot at this disparity. I think Homeboy Industries has changed the metaphor in Los Angeles when it comes to gangs. It has invited the people who live here to recognize their own greatness and does not accuse them of anything. It beckons to their generosity and lauds them for being “smart on crime” instead of mindlessly tough. It seeks an investment rather than futile and endless incarceration. Both this book and Homeboy Industries do not want to simply “point something out” but rather to try and point the way. Thomas Wolfe, in You Can’t Go Home Again, writes, “To lose the earth you know, for greater knowing; to lose the life you have for greater life; to leave the friends you loved, for greater loving; to find a land more kind than home, more large than earth.” We have to “lose” and “leave”—“unless the grain of wheat dies . . .” The kinship of God won’t come unless we shake things up—to “lose the earth you know”—to bark up the wrong tree, and to propose something new. “Barking” declares that the real world is not what it is cracked up to be. At Homeboy Industries, we don’t prepare for the real world—we challenge it. For the opposite of the “real world” is not the “unreal world” but the kinship of God. Therein lies our authenticity as people of faith and card-carrying members of the human race. In this authentic take, survival of the fittest is displaced by the survival of the “unfittest.” Cherry-picking makes way for “reverse cherry-picking.” What if we ceased to pledge our allegiance to the bottom line and stood, instead, with those who line the bottom? Us versus Them . . . or just Us? Good people/bad people . . . or just God’s people? Judgment or awe? Not some accepted/some rejected? . . . No . . . the rejected—the widow, orphan, stranger—are to be favored. Homeboy Industries (and this book) wants to bend the world to grace, and it doesn’t need to turn up the volume in order to accomplish that. It aspires to put a human face on the gang member. If this doesn’t happen then kinship is impeded. It is also meant to soften our conventional take on who this gang member is and ushers in an abiding belief that we belong to each other. It is anchored in the truth that all demonizing is untruth. When we opened Homegirl Café on East First Street eight years ago and the wildly colorful sign sat above the front door, a woman I didn’t know called me screaming, “Why would you name it such a thing? You have ruined our neighborhood.” Oscar Romero wrote: “A church that doesn’t provoke any crises, a gospel that doesn’t unsettle, a word of God that doesn’t get under anyone’s skin, a word that doesn’t touch the real sin of the society in which it is being proclaimed—what gospel is that?” It would seem not to take much these days, to provoke or unsettle. A theme that runs throughout the entire biblical narrative is that God enters our midst to upset the status quo—precisely to bark up the wrong tree. The Magnificat, in Luke’s gospel—where the powerful are brought low and the hungry filled with good things—was seen as so subversive that the government of Guatemala, at one time, banned its public recitation. But the truth is, my own tiny-spirited, puny self accommodates the status quo all the time. We adapt, we conform, and we reconfigure everything so that the status quo feels welcome and at home. When I lived in Bolivia, over thirty years ago, I contracted a bug—a “bichu,” as they called it . . . that wanted to live in me. It did not want to upset the apple cart, so this bug didn’t send me to the bathroom with violent, “both ends” activity. It wanted to live at peace with me. My only symptom was that I lost forty pounds (I’m thinking of returning to Bolivia). The status quo doesn’t want things to get upset. But hidden in this détente is division, polarity, and the striking of the high moral distance that separates us. How do we awaken from the dream of separateness, from an abiding sense that the chasm that exists between us cannot be reconciled? For it would seem that the gulf in our present age could not be wider between “Us” and “Them.” How do we tame this status quo that lulls us into blindly accepting the things that divide us and keep us from our own holy longing for the mutuality of kinship—a sure and certain sense that we belong to each other? Having said all this, this book feels more playful than not. Like talks I’ve been inclined to give lately, they feel more like “stand-up” than “stand up to”—getting folks to laugh rather than calling people to some grim duty. But I don’t want to become the Art Linkletter of the gang world: “Gang members say the darndest things!” For me, however, it’s all about delighting. I enjoy their company, for it is light and affectionate, and charming and good for the soul. To be with them ignites the contagion of God’s own tenderness. I never once feel them less than bright, wise, and courageous . . . even when they deal with things painful and unfamiliar. Few gang members are well educated, and yet their core intelligence and insights aren’t diminished by this lack. The laughter is never at their expense but seeks to broaden the welcome we all must offer each other. Besides, it’s not for nuthin’ that Pope Francis speaks of the “Joy of the Gospel.” Once the following of Jesus becomes a strain and a dour, odious task, a “dangerous” job (“somebody’s got to do it”), it’s lost its way. Once discipleship morphs into the deadly serious and unsmilingly grim, would it not be safe to say that we’ve wandered far from the gospel’s delighting heart? We want to live our lives “out loud”—for all the world to see—not with the volume cranked high but with our lives speaking for themselves. Kinship is the game-changer. It is the Pearl of Great Price. It is the treasure buried in the field. Let’s sell everything to get it. Yet we think kinship is beyond our reach . . . más allá de esta vida. Yet Gospel Kinship always exposes the game, jostles the status quo in constant need of conversion, because the status quo is only interested in incessant judging, comparisons, measuring, scapegoating, and competition. And we, the Choir, are stuck in complacency. I need this conversion. That’s why I’m writing about it. Our settling is a sleeping from which we are asked to awaken. I met some magicians from Magicians Without Borders, who go to refugee camps and the Third World and desperate communities and speak the language of magic. They wanted to bring the same ministry to Homeboy. The currency of magic, they told me, was “appear, disappear, and change.” This describes much of the pedagogy of Homeboy Industries and the stuff of attachment repair. They sold the idea to me based on a principle of Harry Houdini’s. Houdini felt that the purpose of magic was not just to amaze and amuse. It also sought to awaken hope that the impossible was indeed possible. Not bad. Why settle for less? At Homeboy Industries, thousands and thousands of rival gang members—men and women—have worked in our nine social enterprises: Homeboy Bakery, Homeboy Silkscreen and Embroidery, Homeboy/Homegirl Merchandising, Homeboy Diner (the only place to buy food in the Los Angeles City Hall), Homeboy Café at Los Angeles International Airport, Homeboy Farmers Markets, Homeboy Grocery (a line of food products), Homeboy Recycling, and Homegirl Café and Catering. I’d like to think that if Jesus had more time on this earth, he might well have explored the entrepreneurial. Maybe a clothing line: the Leper Colony, or the Tax Collector’s Café, or the Ritually Impure Maintenance Crew. Beyond cure and healing, Jesus was always hopeful about widening the circle of compassion and dismantling the barriers that exclude. He stood with the sinner, the leper, and the ritually impure to usher in some new remarkable inclusion, the very kinship of God. Living the gospel, then, is less about “thinking outside the box” than about choosing to live in this ever-widening circle of inclusion. At Homegirl Café, women with records, young ladies from rival gangs, and waitresses with attitude will gladly take your order (and they cater). At lunch, the place can be packed with celebs, elected officials, and the powerful “who’s who” of Los Angeles. Nearly all the Dodgers came one day for lunch. It was pandemonium. Jim Carrey has dined there several times and it’s always a manicomio—a madhouse. Joe Biden (and a motorcade) unexpectedly landed for lunch. I was out of town. Afterward, a homie is debriefing me. “While you were gone, we were visited by an MVP.” “Do you mean,” I ask, “A VIP?” “Yeah, dat one.” Then he adds, “Imagine, G: here at Homeboy, we were visited by the Vice President of the United States . . . MICK ROMNEY.” (File this under “All white guys look alike.”) We may need to add some currentaffairs classes to our curriculum. That took my breath away when I heard it. And I don’t believe we’ve had any further Diane Keaton sightings, now that I think of it. But suddenly . . . kinship so quickly. Oscar-winning actress. Attitudinal waitress. Exactly what God had in mind. And I suppose, in order to know that mind, we need go no further than Jesus speaking to the gathered when he expresses his deepest longing: “that . . . you . . . may . . . be . . . one.” I suppose he could have been more self-referential. But it would seem that Jesus wants this to be about “us” and our willingness, eventually, to connect to each other. 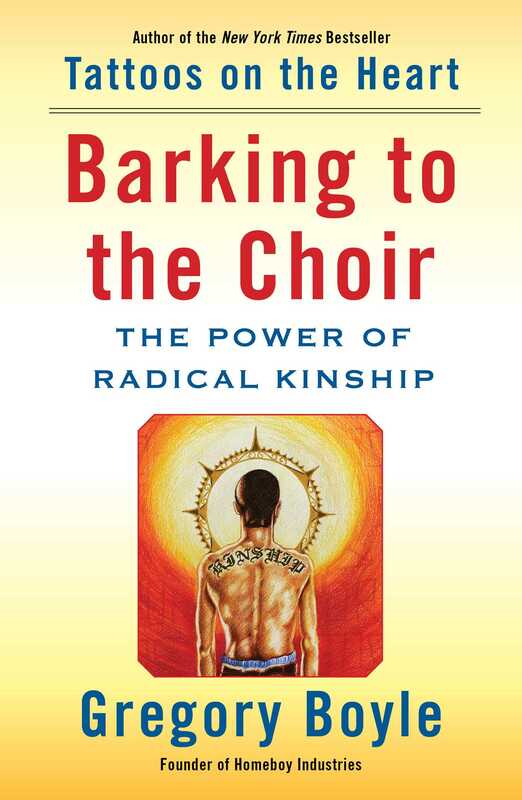 So the Choir gets barked at and, collectively, we move beyond the mind we have. And with enough jostling and juggling, we find ourselves anchored in God’s dream come true. Finally unsettled—connected to each other, entering kinship . . . now!